and least (visually & architecurally) impressive rail terminus. in a pipe below the M8 motorway. building built on it's site curiously kept to the same misalignment. to have on the city centre is clear to see in these images. Last edited by james73 on Mon Dec 25, 2006 5:34 pm, edited 6 times in total. A4 No. 60034 leaves for Aberdeen. Scotrail House is under construction in the background. Picture taken from the tunnel retaining wall. B1 4-6-0s No. 61244 'Strang Steel' and A4 No. 60026 'Miles Beevor' wait to depart August 1965. The wooden walkway between the tracks was apparently for the convience of the staff. An overview of the station from the Dobbies Loan roadbridge. The 'grottyness' of the station is plain to see in this shot - kind of like Blackpool North with less character... The platform canopies were apparently taken from the closed Ardrossan Harbour station. A2 No. 60528 'Tudor Minstrel' enters the station May 1966. The roadbridge in the background is Dobbies Loan. Unlike St Enoch, Buchanan Street never lost it's semaphore signalling. The familar sight of the Sauchiehall St office block in the background. Enthusiasts watch A4 No. 60031 'Golden Plover' leave for Dundee, April 1965. A2 No. 60532 'Blue Peter' departs towards the tunnel July 1966. A4 No. 60034 '' departs for Aberdeen July 1966. Scotrail House is under construction in the background, but is barely visible thanks to the plume of steam. V2 2-6-2 No. 60816 climbs uphill towards St Rollox station. The area of this photo has now been filled in totally. The bridge behind carried a freight rail line into the Pinkston works. Behind that (hard to see) is a road bridge which carried Pinkston Road over the railway as it appeared from the tunnel. The entire area, to this day, stinks to high heaven thanks to the chemical factory that was nearby. The muddy ground next to the track was said to be saturated with waste from the plant. Last edited by james73 on Wed Jan 05, 2005 1:36 am, edited 1 time in total. These are all excellent pictures. It is quite astonishing how much the area around the bus station and Queen St Stn has changed since these pictures were taken. The last picture in your first posting (the one with the new bus stn complete) shows in the foreground that isolated pub (Mathew Reid I think it says). Behind this is the site of the old Dundas St bus stn. On the cream coloured wall behind the pub you can just make out an oval shape, which is the remnants of a large 'Bluebird' logo that once flew proudly on this wall. This of course was the logo of Alexander's 'Bluebird' buses/coaches. On the subject of that pub, I recall an isolated old spit'n'sawdust pub surrounded by ad-hoc car parks that existed on these sites around that time. I think it was called Bar 82, and always seemed to be popular howf. It remained in use until the mid 80s before the concert hall was built. Was this the same one as in the picture, or was it another? If you walked straight south from the new bus station, across the car parks where Parliamentary road was previously, heading straight down Dundas St heading for Queen St Stn, you'd pass it on your left. I was never in it (I was a teenager at the time), but it always looked a real old fashioned joint. Anyone else remember it? partickular wrote: On the subject of that pub, I recall an isolated old spit'n'sawdust pub surrounded by ad-hoc car parks that existed on these sites around that time. I think it was called Bar 82, and always seemed to be popular howf. It remained in use until the mid 80s before the concert hall was built. Was this the same one as in the picture, or was it another? If you walked straight south from the new bus station, across the car parks where Parliamentary road was previously, heading straight down Dundas St heading for Queen St Stn, you'd pass it on your left. I was never in it (I was a teenager at the time), but it always looked a real old fashioned joint. Anyone else remember it? took the best part of 30 years to complete this project. the late 1980's. At that time there was nothing to stop you doing this. they put up the fence around the perimeter. Another ace pic James, with (I think) a nice Ford Consul Capri in the foreground. I remember that fruit and veg shop too now you mention it. Funny how it survived being out on a limb like that. I think the area in question was used as a car park before the fence you mentioned was put up, as you could use it (and many did) as a thoroughfare between the bus stn and Queen St station. I seem to recall it was edged (at least on the Killermont St side) with those metal bollards around 4 feet high with black and white stripes on them. The details are all a bit hazy now though. Yes indeed it was a disgrace. What tourists must think of the mess and litter on the streets of Glasgow even today is an embarrassment. in the body of your message like this: [ img ] (without the spaces). give you some free webspace as part of your account with them. up in this message and would be clickable. Jings! Thanks for explaining it. I'll give it a go sometime. 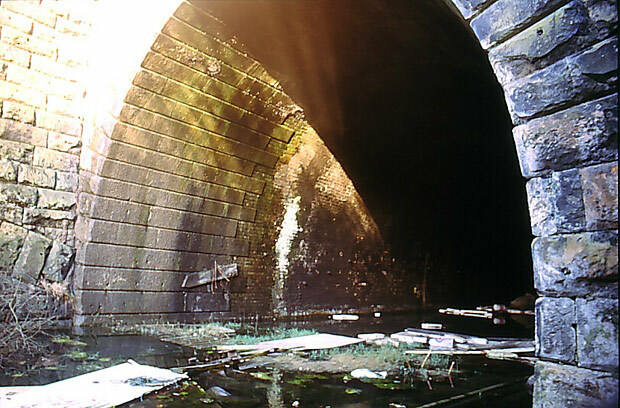 The stone arch on the lower left of the picture is where Queen Street High Level tunnel runs directly underneath the entrance to Buchanan St. tunnel. appears that it was removed, and there's evidence of some local subsidence. Could that not be the air shaft shown on the map? in on the other side of Springburn Road next to the Cawder Bar.